Reverse phone lookup sites are websites created specifically to help consumers identify unknown phone numbers. If you receive phone calls or text messages from restricted numbers, then a reverse lookup service can be helpful to you. Often you will be able to find the caller’s name, address, and more. 1.) You check the caller id on your phone and find that you received a missed call from (760)555-5656. Who called you, and where is the 760 area code from? 2.) While doing some Spring cleaning, you find a crumpled up piece of paper on your work desk with a phone number on it. There is no name, only the mysterious phone number. You don’t remember whose number it is or why you wrote it down in the first place. 3.) Your cell phone shows a call from a number that you don’t recognize. Should you call the number back and risk a lengthy discussion with a salesman? Maybe it was a wrong number? 4.) Your monthly phone bill shows extra charges this month. You see a few different numbers that you don’t recognize or remember calling or texting. Did you contact these numbers or is this an error? Now that we’ve gone over a few potential day to day situations, what is a reverse phone lookup and how does one work? Do I have to pay to use a reverse lookup service? Before we dive into it, a brief history lesson on reverse phone directories as a whole might be helpful. Before the internet was where it is today, phone companies would publish their own individual phone directories (otherwise known as reverse white pages). These directories would be categorized by area and were made available to law enforcement, libraries, etc. While these directory books would usually have information on businesses and other residences, they would not include unlisted numbers, cell phone numbers, or faxes. For more information on the history of phone lookups and how they work, you may want to read this Wikipedia article. The internet proved to be much quicker and convenient to physical reverse phone directory books. There are a few options available online for free reverse phone lookup of landline numbers and cell phone numbers. 1.) Using Google or any other online search engine, type a phone number that you want to find more information about into the search field. Press enter and you will be shown results related to the unknown number. You may be able to find some helpful info doing a quick Google search, but often the information freely available will be outdated or incorrect. One interesting thing to note is that Google actually used to have their own sort of number lookup service known as Google Phonebook. Google’s reverse lookup service would show the name and address of the phone number owner as well as a map showing their location. 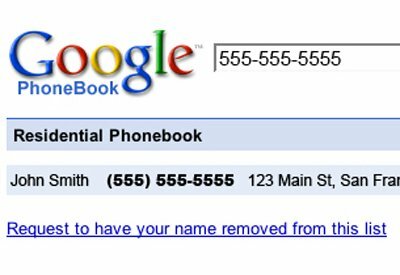 Google Phonebook was a reverse directory which showed the name and address of the owner for a phone number. The service is no longer active. 2.) Type “reverse phone lookup” or “reverse number lookup” into the search field and press enter. You will be shown a list of different websites that offer reverse lookup services. You may want to go through these sites one by one and individually search the phone number in each. Many of these websites will charge you for access to “premium” information about the phone number and its owner. If you want to use one of these services, you can pay for each search individually or pay an annual fee for unlimited number lookups. 1.) Shortcodes.org is a free cell phone directory website which allows users to reverse lookup numbers that send them text messages (or short codes used by companies for marketing). They are also the only website available which offers information on thousands of short codes and which companies use them for texting. There are no fees to search or view reports left by other users. Often, these user submitted reports will contain sufficient information to find who owns the number. Shortcodes.org powers hundreds of thousands of completely free number searches each and every month. 2.) Whitepages.com receives tens of millions of searches every single month. Back in 2008, the Whitepages.com database apparently had information on over 180 million American people (this amounted to roughly 80% of U.S. adults). Along with information on numbers located in the United States, the site also has additional information available on some international numbers. It may be worth noting that along with typical lookup data, you can also pay an additional fee to access a background check on the owner of the number. 3.) Intelius.com is another reverse cell phone number lookup provider which hides the majority of its information behind a paywall. You will either pay a one time free for access to lookup information or subscribe for monthly payments. Like the others previously listed, Intelius appears to have a wealth of information (even outside of just phone number to name searches), but this appears to all be available after paying the previously mentioned fees. Making information on who owns which phone numbers public knowledge seems like the most consumer friendly solution at this time. With caller id not always being too helpful, these “phone number to name” services seem to be addressing a real need that doesn’t appear to be going away anytime soon. Tim on 46767 Short Code467-67 I have never opted in or given consent and have reported them to the FTC. j S n Murthy’s on 292978 Short CodePlease help me to recover my gmails and make me use google mail.Please kindly help me. Kelsea Johnson on 244444 Short CodeTake your phone number off this site sweetie. This isn't Google. Anyone on the internet can see your info.